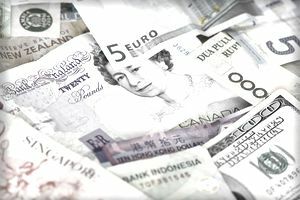 If you're a new entrant to the foreign exchange (forex) trading world, you have probably been bombarded with advice from various sources that promise to help you build your forex assets at a rapid pace. One of the more lofty pitches out there suggests that novice forex traders can start with $100 and see that money grow to as much as $10,000 within one year, or at the very least double that $100 within one month. This raises the question of whether or not such claims are possible even with aggressive strategies, and whether novice traders even stand a chance of this kind of return, versus the more likely outcome of losing all of their trading capital. Theoretical patterns of gain or loss do not always translate into probable outcomes on the foreign exchange market. If you work a little math using a return on investment (ROI) calculator, it can help you put into perspective what would be necessary to turn $100 in assets into $10,000 within one year. Your annual rate of return on your initial investment would need to be a staggering 9,900 percent to achieve such a return. Breaking this down another way, you can use the compound interest calculator provided by the Securities & Exchange Commission (SEC) on its Investor.gov website to determine how much your daily rate of return would have to be to have a $9,900 profit at the end of one year. The compound interest calculator (which in this case is used as a profit-compounding calculator) shows that if you entered and closed out one trade every day of the year, the average profit on each trade would have to be at least 464 percent. In other words, you would have to more than quadruple your money every day to come even close to $10,000 at the end of a year. While you might find that you can make large profits from some trades that hit the market just right, it's the requirement for consistently profitable trades, day after day, that creates the most difficulty. Some sources say that even expert traders have a trading win rate, or percentage of successful versus unsuccessful trades, of anywhere from 55 percent to 70 percent. A novice trader would most likely have a lower win rate, along with the difficulty of finding enough profitable trades to enter into consistently each day over the span of an entire year. There may be a few traders who believe they can achieve such returns on a consistent basis but looking at the volume of assets that exists in the entire world puts the matter in perspective. A MarketWatch article estimated this to be about $90.4 trillion as of 2017. Now assume that instead of $100, a few large investment banks make trades with the same 464 percent daily profits, reinvested daily. For argument's sake, assume the initial trade commitments of 10 large investment banks each totals $80 million. These are huge investments, but keep in mind that the daily trading volume on the forex can range from $2 trillion to $5 trillion depending on periods of volatility. The 10 big banks' huge investments might only account for about 20 percent of the forex's daily trading volume depending on activity. If these big banks had the same 464-percent daily return needed to produce a $9,900 profit on an initial investment of $100, how much money would they have at the end of one year? According to the calculator, about $80 trillion, an amount that almost equates to all the money in the world. You might be a fan of the statement, "Never say never." It may also initially seem plausible to assume a trader could to turn $100 and into $10,000 within one year, but breaking down the math on return rates shows how unlikely this really is. While it may be theoretically possible, in reality, it's not a credible expectation when put into real-world practice.